I owe every bit of inspiration for tonight's manicure to an unlikely, but highly inspiring source: PixelgirlPresents. I found this site when I first got a laptop for college in 2006. That was six years ago, but now outdated Dell I was given as an awesome present from my Dad makes it seem like much longer. PixelgirlPresents offers graphic artists a chance to get their work on peoples' desktops, phones and electronic screens of other sorts. It's all run by one girl, and the submissions are always unique and colorful. I'm a fan of bold patterns and designs, so I've had this bookmarked for a long time. Browsing it the other day for an updated background, I stumbled upon something I looked at and thought to myself, "Katy...you need to put that on your nails." I give myself great advice sometimes, so thanks past-me for that great thought (and for quickly saving the picture to your phone to reference later). The design I used as my guide was by the artist Plumeology, who, judging by their PixelgirlPresents bio page, has only submitted one design to the site. They do link to a company webpage though, and it seems they're a design company offering services like logo design, advertising, and business name consultation. See? Unlikely source for inspiration! If you're in San Diego, I bet they offer some pretty designs if their work is anything like their logo. So, without further ado, here's my interpretation of their beautiful logo! I used Load (Illamasqua) as the base. The plumes were done with Electric Pineapple (China Glaze), Sea Breeze (Sally Hansen Insta-Dri) and Dream (Savina). Yes I know, I'm reusing colors, but I keep getting drawn to the same bottles. The decorative swirls beside the plumes were done with Pelican Gray (China Glaze), and it was all freehand. Maybe that's why only two nails got the treatment. Very elegant manicure. I love it! I love this design and the colours are amazing. So pretty :)your nails look perfect! 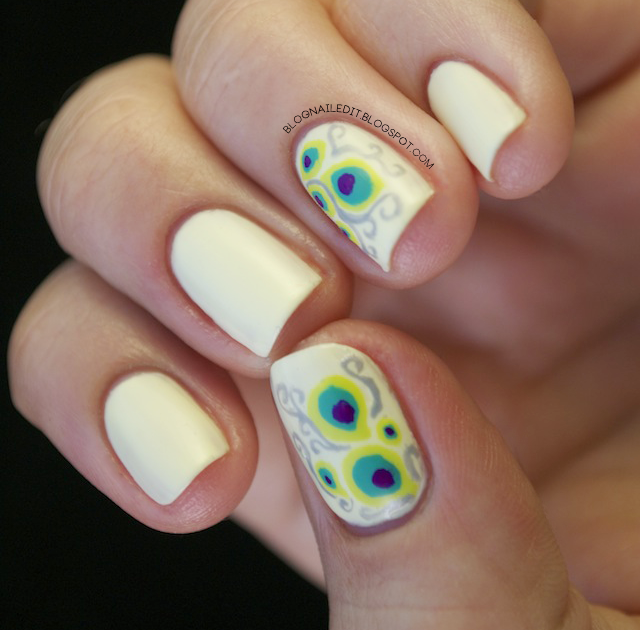 Beautiful nail art! I love it!